1A Photo Tells the Success Story! 4TrapsDirect Can Help You Too! A Photo Tells the Success Story! Every month here at TrapsDirect we sponsor a photo contest in which we invite customers to send us their most impressive photo showing the outstanding pantry moth catching ability of our line of pantry moth traps. Many times, a picture does truly speak a thousand words, or in this case, at least dozens of pantry moths. Customers who submit one of the five best photos of the month receive a gift certificate that can be redeemed for a set of two pantry moth traps. In addition, all customers who submit a photo showing a used pantry moth trap with at least 10 pantry moths caught will receive a 10% off coupon to be applied to a future order. 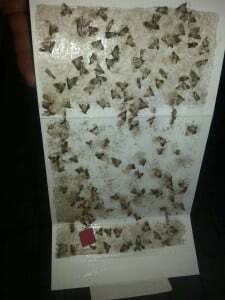 Here at TrapsDirect, it pays to take and submit a photo of your pantry moth trapping success stories. This photo was submitted by a customer who placed the pantry moth trap in her kitchen, a common location for pantry moths to appear. As you can see, she had great success with trapping pantry moths using our pantry moth traps. By using our traps she was able to resolve her moth infestation, and she learned that spending a little more money on good quality moth traps, in the end analysis, saved her far more money than it cost. Most importantly, all of the staff members here at TrapsDirect offer our condolences to Karen on the loss of her mother. 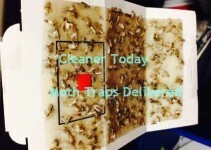 Despite her loss, we here at the TrapsDirect Customer Response and Support Department were very pleased to hear about Karen’s excellent results when using our moth traps and she highlights several key points about moth traps and moth trapping practices that we emphasize routinely with all customers. First, Karen placed the traps very close to the source of the moth infestation. 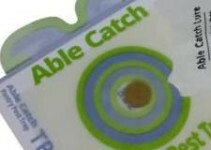 This is very important for effective moth control and for restricting the degree and extent of the infestation. While moths can fly, obviously, and they can move through your entire house, locating the moth trap convenient to the moth instead of a location that might seem more convenient for you, will help limit the degree to which moths must fly in pursuit of the pheromones in the trap and reduces the chances that the moths will discover additional food sources, resulting in additional loss to you. Second, Karen learned the cash value of prevention. Good quality effective moth traps are not free for anyone, although we here at TrapsDirect do our best to keep prices low by working directly with the manufacturers to negotiate the best prices through quantity purchasing, keeping overhead costs down, and by maintaining an Internet-only store which eliminates the massive costs, which are passed on to consumers, of running brick and mortar outlets. We also only sell products manufactured in the United States so there are no costs associated with long ocean voyages and customs fees to pass on to our buyers. And as Karen discovered, once moths arrive in your home, they will soon invade many other food stuffs, even in a matter of days, and those infested foods are ruined and must be discarded. Because of the cash value and cost of replacement of the wide variety of foods, both for people and pets, that pantry moths will invade and destroy, one highly effective moth trap purchased from TrapsDirect for as little as $1.97, when bought as part of a pack of 20 moth traps, could save you easily over $100 or more by preventing the loss of valuable food stuffs in your kitchen or pantry. And Karen, as is true of so many of our customers here at TrapsDirect, recognizes the value of a non-toxic solution to pantry moth trap infestations. 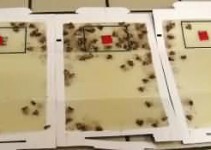 She is absolutely correct that she can place our completely non-toxic traps right on the surface of bulk foods in large storage containers to eliminate moth infestations from imported food items before the problem can even start or leave the container. We highly recommend this type of placement and usage of all the moth traps we sell here at TrapsDirect. TrapsDirect Can Help You Too! Everyone at TrapsDirect is pleased that Karen found success in erasing pantry moth problems from her kitchen by using our products. We hope that Karen’s story helps you in your decision making process about the best way to address any pantry moth trap problem you may be facing.